Classic damascus knives from Shigeki Tanaka. Shigeki uses VG-10 steel from Tafeku for his cutting edges - a hard wearing steel containing 1% molybdenum which gives it great toughness as well as cutting ability. 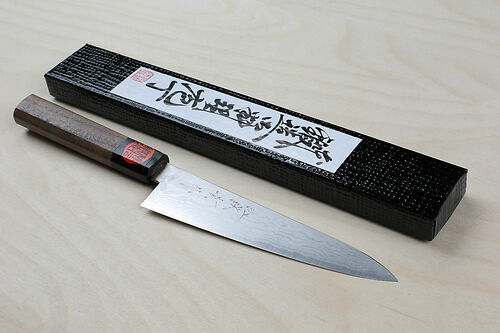 Clad with 17 layer stainless steel damascus it holds a great edge and resists rust well, and fitted with an octagonal walnut handle it straddles the gap between Japanese and western knives nicely. Niwaki Tip: Sharpen with Shapton stones - we use the #2000 Glass Stone as our regular.